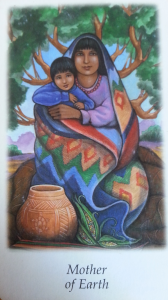 The child on this card is clearly feeling safe, warm and protected, held within the safety of family and home. Mother of Earth knows how to care for her children; the female authority of the earth element or physical world, she is, in a word, effective. She is also patient and present, without demands or conditions. Today, take time to appreciate your family, especially the strong and tender women in your life. Notice your own strong body, male or female, feel your softness, enjoy your senses. When you work with your hands today, pay attention to what you are doing. When you take care of your world, it will take care of you. You can get your own copy of the Vision Quest Tarot Deck here.